As we enter the autumn of 2015, Pencils for Africa will have been in operation for over 3 years and is now entering its 4th year of operation. Pencils for Africa (PFA) began earnestly in February of 2012 with a group of 4th grade students. Three of these 4th grade students back in 2012, Lucia, Carly and Charlotte, are now entering 7th grade as the Co-Editors-in-Chief of PFA. Ms. Chyah Weitzman, the steadfast PFA mentor and teacher, initiated a PFA conference to mark the inaugural year of PFA in December, 2012. On Sunday, December 16th, 2012, an inaugural PFA conference took place amongst 10 of the 4th graders at St. Hilary’s school, to discuss the values and purpose of Pencils for Africa. Led by their teacher and mentor Ms. Chyah Weitzman, students discussed future prospects of PFA. Much discussion focused around the need to carefully nurture and cultivate the relationships with the children in Africa with whom the 4th grade class was connecting and communicating. We need to connect with their culture but not to change their culture. Many people are trying to change African culture because they think they know better than Africans. We do not feel that way at all. We want to connect with and learn from them and share what we know as well. We need to build understanding and also show Africans how much we respect them. “For example, right now in the Holiday Season here in Marin, people are just going to stores and buying and consuming so many of the resources of the planet for stuff they don’t really need. Lucia then led a discussion based on the ecological relevance of sending used pencils verses new pencils to children in Africa. In February of 2012, Lucia interviewed Oxford University professor and palaeoecologist (tree expert) Dr. Elinor Breman on the subject of cutting down trees to make pencils. (Click here for Lucia’s interview with Professor Breman). A single tree can make casings for somewhere between 172,000 and 300,000 pencils. “I am very concerned by the cutting down of trees to make more pencils. I just think we all need to be more aware of this. Here in America, we need to make better use of our pencils and not just throw them away because the eraser got used up or because it is stubby and blunt. We need to just make an effort to sharpen the pencils and make better use of them. And if we are not willing to do that then at least we can recycle them by sending them to children in Africa who seem to show much more respect for the earth’s resources than we do. Some children in Africa share one pencil between 30 students in a classroom. Some children in Africa share one pencil between 30 students in a classroom. They know what living with less means – we don’t. We’re pretty spoiled. When CNN Hero Jackson Kaguri was informed about this 4th grade conference and heard the thoughtful comments by students such as Lucia, he immediately signed up to become the Global Ambassador for Pencils for Africa. Thank you Lucia and the rest of the PFA 4th graders for your compassion and insight for children in Africa! Mr. Kaguri’s endorsement of Pencils for Africa in turn created a groundswell of support for PFA, which has culminated today in a high calibre PFA Advisory Board and PFA Executive Board. The 3 years following the origins of Pencils for Africa in February, 2012, witnessed a remarkable renaissance of prolific productivity and perseverant progress by the PFA students. For example, the original discussion of the need for pencils for communities in Africa, led to more understanding of this issue through interviews with experts on this subject such as Jackson Kaguri. This in turn, led to initiatives such as used pencil drives, which then culminated in the PFA students sending pencils to children their own age in the Congo, who has seen war and conflict. The children in the Congo were grateful for the used pencils they received from the PFA Team. Over the 3 years, many similar ”pencil pal” correspondences were initiated between the Pencils for Africa students and their peer group students in Africa. In addition to the Congo, PFA students have now corresponded with children in Kenya, Uganda, Sierre Leone and several other African countries. Moreover, the compelling need to reach pencils to communities of children in Africa that need them, has culminated in the initiative of One Pencil Per Child (OPPC) which is headed up by former PFA Editor-in-Chief, Nicolas Meringolo. (Click here for the OPPC website). Sending used pencils to the Congo brought out an expected discussion about understanding children such as these in the Congo who had lived through war and conflict. PFA Team discussions now revolved around how children in conflict zones could recover and find the opportunity to gain literacy and education and thus aspire to improve their lives. Clearly, these African children would need a lot of nurturing. Our PFA Global Ambassador, Jackson Kaguri, shared some of his insights from his work building orphanages about how he helps nurture the children through his volunteer ‘army’ of over 7,000 grandmothers! This led to a discussion between Jackson and ‘Grandmother Power’ author, Paola Gianturco on the nurturing power of grandmothers in Africa. (Click here to read the full discussion between Paola and Jackson). However, the PFA Editorial Team were still not satisfied and so Jackson kindly initiated another discussion, this time with Harvard University professor Sarah Dryden-Peterson, author of ‘Educating Children in Conflict Zones’. Harvard University professor Sarah Dryden-Peterson’s discussion for Pencils for Africa also launched PFA’s first step in building an alliance with Harvard University. Here is an excerpt from Jackson and Sarah’s discussion that led to the PFA Team initiating a book drive to Kenya. “In addition to technology and learning, I think it is true the world over for your 10 year-old son Jackson, for my 6 year-old daughter, and for the many millions of children worldwide, that they have a voracious appetite for books and reading material. A small number of books can go a long way. There is a real shortage of libraries and books in African refugee camps. The new United Nations High Commissioner for Refugees Education Secretary has placed an emphasis on getting books for reading into hands of children, but it is a difficult endeavor. Books are expensive and get worn and torn with use. (Click here to read the full discussion between Sarah and Jackson). On Wednesday, July 23rd, 2014, representatives of the Pencils for Africa Editorial Team reached a milestone in their pioneering work by receiving the opportunity to make a presentation of their project development work to Google at Google headquarters in Mountain View, California. Nicolas, Carly, Colin and Charlotte. The presentation was made to a number of Google representatives including our hosts at Google, Carolyn Au and Emma Bindloss. After a tour by Emma and Carolyn of areas in the Google facilities, the group got lunch at the Google cafeteria after which they headed up to a conference hall where Nicolas, Carly, Colin and Charlotte gave presentations to a Google team. The moms of Nicolas and Charlotte, Joyce and Elizabeth, were in attendance at the Google presentation, as was PFA teacher and mentor, Ms. Chyah Weitzman. (Click here to view PFA’s Google presentations). In the Spring of 2015, the out-going Editor-in-Chief, Nicolas Meringolo, wrote a letter to President Barack Obama on behalf of the entire Pencils for Africa Team. Nicolas’ letter to President Obama was delivered to the White House. A copy of Nicolas’ letter to President Obama was also delivered to Archbishop Desmond Tutu in Cape Town, South Africa. “The goal of Pencils For Africa (PFA) is to change the narrative and perspective of Africa and to level the playing field between Africa and other countries. We have also learned many life lessons at PFA. We have learned to listen to others and to be nonjudgmental to what others have to say. We have learned how to accept different cultures and ethnic backgrounds, and to cherish peoples’ differences. But by far, the most important lesson we have learned is the spirit of Ubuntu. The important Ubuntu values and morals are the motivation of our PFA middle school team. We create an Ubuntu community with each other, as PFA members, and also create an Ubuntu with other organizations working for Africa. We have connected with these organizations and have donated money to their cause. We use this spirit of Ubuntu to help us in our daily lives. Another topic that we often talk about is the concept of the Kitchen Table. The concept is based on the fact that we should talk about the information that we gather at PFA during meals at the Kitchen Table, with our families and friends, so that we can inform more people about our work. The Ubuntu “concept of the Kitchen Table” which Nicolas describes to President Obama in the above letter was subsequently developed into a program called African Kitchen Table which is now being led by the Editor-in-Chief of African Kitchen Table, Shannon Sutherland. (Click here to visit the website of African Kitchen Table). The idea of “Ubuntu values and morals” which Nicolas describes in the above letter to President Obama, is an idea that the Pencils for Africa editorial team have discussed extensively. One of their research findings in reading historical books about the European Scramble for Africa about 100 years ago, is that the contemporary relationship between Europe and Africa is tainted by Europe’s historical exploitation of Africa’s people and resources. “It is important to view the prospects for peace in Africa through the historical prism of Africa’s dominance by European powers. By being sensitive to the historical context of the Scramble for Africa, we in the West are less likely to continue to superimpose European or Western ideals upon the African continent. We in the West, are more likely to be effective in meeting local needs in Africa by first being respectful to Africans and listening to local people on the continent of Africa. (Click here to read Colin’s complete interview for African Peace Journal). Colin is taking these ideas to the next level by heading the Unscramble for Africa program. (Click here to visit Colin’s Unscramble for Africa website). Excellence in writing and communication skills are a core value of the PFA Editorial Team. A preliminary activity of all interviews conducted by the PFA Editorial Team includes extensive research on the interview subject as well as thorough preparation of questions. A ‘newsroom’ atmosphere permeates all the PFA Editorial Team during the time leading up to an interview. Post interview, the PFA Editorial Team review the responses and then write ‘reflections’ which they are also posted on this website and sent to the interviewee. Molly Burke, Executive Director of Uganda-based Bicycles Against Poverty, is one of the many interviewees that the PFA Editorial Team have interviewed. What PFA have done is to create a bridge within an industry where too often streams push through new boundaries, but connections across them never get built. We build nonprofits, but not the right mechanisms for them to interact. The PFA community strives to ensure that organizations in similar regions are able to connect, network, and learn from one another. To say I’ve been impressed with the students I’ve interacted with is an understatement. Blown away. PFA’s analysis is deep, style professional, and their tone always resonates with dignity for others. 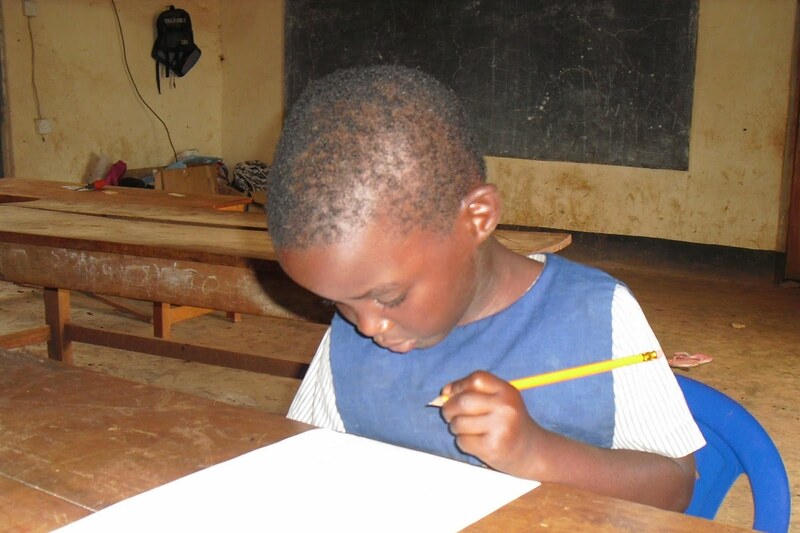 Today, the Pencils for Africa students do not just sit in a classroom in Tiburon, California. They sit at the epicenter of a global community of people who are passionate about African life. One of the students interviewed me and published her article online (click here for Lucia’s interview of Paola). All the children wrote reflections about our sessions, and published their articles on the Pencils for Africa website (click here for the reflections). I published pictures of the Pencils for Africa students on my Facebook author page. Imagine events like those happening consistently with other speakers who visited in person or via Skype, year after year. The commitment to excellence in young journalism by the PFA Editorial Team has now led to middle school ‘graduates’ of PFA, such as Nicolas and Shannon, to continue to hone their journalistic skills within the context of a post-PFA program called the Young Journalist Program. (Click here to learn about the Young Journalist Program). PFA has built alliances with major US universities including Stanford, Harvard and MIT. Alliance-building first began back in January of 2013, with the above-mentioned Harvard University professor Sarah Dryden-Peterson. In the May of 2015, the Pencils for Africa program was presented at Stanford University to an international conference of visiting educators from Finland, Poland, UK and other countries. Moreover, with PFA’s work connecting with remote rural areas of Africa to understand endangered tribal cultures and endangered African wildlife such as in the Samburu in Kenya, PFA is currently building an alliance with the Future Storytelling Group at the Media Lab at MIT. The PFA Editorial Team has been in regular contact through Skype calls with tribesman Lekadaa who is an environmentalist, tracker and wildlife conservationist in Samburu, Kenya. PFA has provided Lekadaa with a laptop and a video camera so that he can help document his tribal community in Samburu for the PFA students. This includes filming the local tribal school and the peace and reconciliation meetings held routinely by tribal elders in Samburu. (Click here to read the reflections on the PFA Skype call with Lekadaa). As a wildlife conservationist Lekadaa is concerned about protecting and preserving the elephant sanctuary in Samburu. He is sharing his knowledge of conservation methods with PFA. During his most recent Skype call with the PFA Team, Lekadaa explained how his Samburu community is dealing with a drought by diverting the local river and digging wells for water. PFA teacher and mentor Chyah Weitzman visited Samburu in Kenya back in November of 2013, at which time she met with Lekadaa and with families and tribal elders in the Samburu community. (Click here to learn more about the PFA – MIT alliance). Why not use PFA Editorial Team interviews as a way to ‘vet’ African non-profits, as a form of ‘due diligence’, from which to then build a ‘portfolio’ of non-profits in Africa, which PFA can then raise money for through school fundraisers? The answer to this question is “Portfolio PFA” which is a donation model that is modeled upon the same criteria as an investment management portfolio. In fact, Portfolio PFA even utilizes ‘3-letter ticker symbols’ similar to the stock of traded companies (‘stock symbols’) that are part of the business language and vernacular of NASDAQ or the New York Stock Exchange (NYSE). For example, Bicycles Against Poverty in Uganda = BAP. Catalyst for Peace in Sierra Leone = CAP. These ‘3-letter ticker symbols’ signify the donation targets that the PFA Editorial Team through their research and due diligence. Carly is now heading up the Portfolio PFA initiative and taking it to the next level. This work by Carly will include ‘news feeds’ from the updated newsletters regularly sent by organizations such as BAP, CAP and HBF on the progress of their work. These newsletters will be highlighted for the main points and then be streamed as new feeds on the Porfolio PFA website similar to the way news feeds appear on the Bloomberg channel. PFA Co-Editors-in-Chief Carly, Charlotte and Lucia will also provide updates on new donation targets that they have identified through their latest research, interviews and due diligence. You are weaving a wonderful fabric of caring and giving! (Click here to view the Portfolio PFA website). PFA Co-Editors-in-Chief Carly, Charlotte and Lucia, together with PFA ‘graduates’ who are now entering their freshman year in high school, Blanche and Shannon, are collectively the founding members of the PFA Film Festival. On May 21st, 2015, the inaugural PFA Film Festival was held at St. Hilary School in Tiburon. The next PFA Film Festival, to be held in May of 2016, is currently in the planning stages. (Click here to view the PFA Film Festival website). We have now come full circle back to the idea of initiating young students into the idea of discussing and exploring the value of understanding the African continent and interacting with their peer groups in Africa. Lucia, Carly and Charlotte, who are now entering 7th grade as Co-Editors-in-Chief of PFA, started up with Pencils for Africa over 3 years ago in February, 2012 when they were in 3rd grade. In many places in Africa, the children are making sure they don’t waste any resources and that they respect the planet. So, that is something we can learn from the children in Africa so we can be better world citizens. This idea of a respect for resources which was voiced by the current Co-Editors-in-Chief of PFA when they were in 4th grade, is now being incorporated within the ethic of Junior PFA. Specifically, the Junior PFA program will be launched with art and craft projects that replicate the respect for resources that children and communities in Africa demonstrate through recycled toys. The progress and activities of Junior PFA will be documented by Ella, who is the Junior PFA Editor-in-Chief. We now look forward to seeing how this brand new student group who are joining Junior PFA, entering in the autumn of 2015, will themselves develop one day into world citizens who make an active and thoughtful impact upon Africa and upon the world at large. (Click here to view the Junior PFA website). It is going to be another fascinating year for PFA – full of inspiration and innovation!